The power of memory, the sweetness of harmony, Brewer & Shipley are true originals among the swarm of imitators that populate rock. Originals to be sure, but still within a rich American tradition that goes back to the original Carter Family and forward through Richard and Mimi Farina, The Byrds, Crosby, Stills, Nash and Young. For unlike many who have foundered trying to catch the "current wave", Brewer & Shipley have caught the wave within themselves, a deep artistic current that has something to do with the country farm in Missouri where they have settled their families. Brewer & Shipley take the listener back within himself to the springs of memory and experience which are buried beneath the details of daily life. Their music is gently provocative and evocative that much of what you "hear" is fruit of you own life and you own strength of imagination. But the music is there, and the lyrics - their lyrics always seem to tell a story - are there too. chorus. The melodies flow with the ease of memory. At this point, one can only wonder about all the resistance Brewer & Shipley encountered with their famous song "One Toke Over The Line". It was understandable, in the highly politicized atmosphere of those days, that references to drugs would have been taken negatively in certain quarters. But as we all have seen, Brewer & Shipley were well ahead of the counter-culture recognition of the damage that was being done from a life style that was always "One Toke Over The Line". Their song was not an endorsement of the experience, rather a sweet, sad vision of the effects. A year later Neil Young returned to this theme with his song "The Needle And The Damage Done", while newspaper ad and subway wall posters now calmly but firmly broadcast a non-hysterical warning about the real dangers. It is not surprising that Brewer & Shipley were among the first of their contemporaries to meet this problem. 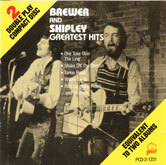 Unlike the back-to-the-land settlers who are simply taking their urban problems to the woods, Brewer & Shipley have experienced the whirl of New York, San Francisco, and L.A., and have chosen their idyll in the outlaw country of Missouri but because it suits them, and strengthens their music. Poetry, said Wordsworth, is passion recollected in tranquility. 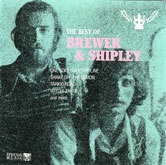 Brewer & Shipley are among rock's most poetic figures, recalling the passion of life in the tranquility of their songs. Your memory is enough for me. and the 1989 Greatest Hits compilations.